Sue and David of snikwah motor werks are the most inspiring, savvy, kind, people, who have made a business out of their life’s passion: German vehicles and touring through the Pacific Northwest. 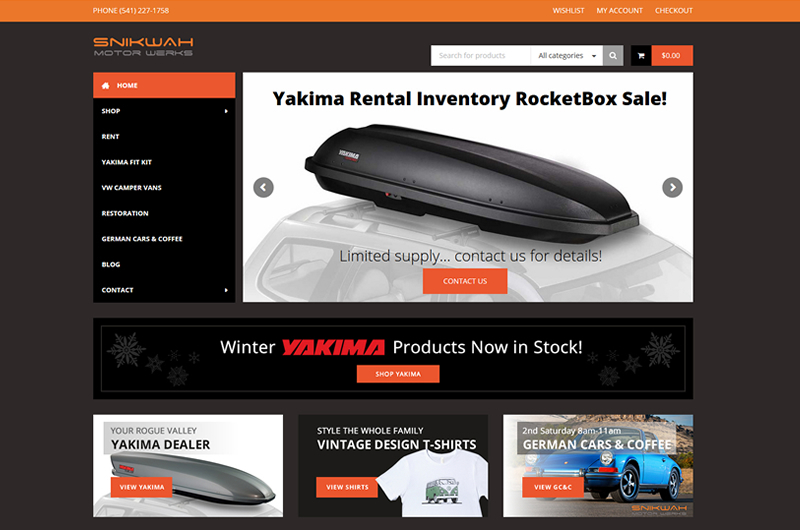 What better way to tour with than YAKIMA gear? Which they rent, sell, plus install locally for FREE! They also restore cars, and they host German Cars & Coffee on the 2nd saturday of each month in Talent Oregon. Soon, they will be offering fully outfitted VW Camper Vans for rent. This site would not be possible without the sheer brilliance of Happy Dog Web Design. What a total blast this whole experience has been! After all of the laughter, giggling, and tears of joy, we ended up with a web site that far exceeded our expectations! Erin had an amazing ability to grasp our unique business, she listened to our needs, and magically understood our style! We appreciated her impeccable communication and action to results, we always knew what was up. Her Associates are a treat to deal with as well. Lastly, we really feel like we got a lot more web site than we paid for. Truly amazing!!! Thank you Erin and RSD.!! !